This article was originally posted to 'eBay Buying Guides' in 2014. Due to the enormous amount of dishonest sellers stealing money, my vision for the article was to help educate and protect the unsuspecting buyer. But it became so much more. When figBid went live I took the article down from eBay, updated the content and posted it here. At the time the article had very close to 5000 hits which makes me smile. There's tons of solid information for newcomers, veterans, buyers, and sellers. Please give it a read. Fig trees are tightly woven into the fabric of today’s society. They are steeped in family legends of grandparents who immigrated to the United States on ships from regions surrounding the Mediterranean. Most families had nothing except for the clothes on their back, hope and a small fig tree or cutting tucked away. Those fig trees were grown using methods taught by their own parents, and they provided a healthy, delicious fruit with a strong connection to home. The care and maintenance that was afforded to any fig tree became symbolic of the struggle, growth and development of their own families in the United States. Those lucky enough to have grown up around a fig tree share in that bond with their ancestors. Many people continue the tradition of growing fig trees just as their parents and grandparents did. Some own heirloom varieties that have been with families for many, many generations. Others own exotic varieties that were discovered in some far, wild corner of the Earth. While others own extensive collections of hundreds of varieties, sometimes spanning many acres of land. Whatever the logic or reason, in recent times there has been an intense interest for growing figs. And it doesn’t look like it’s going to slow down any time soon. That’s where this guide comes in. Here is a set of guidelines to help you navigate the sometimes perilous waters of buying fig trees or cuttings online. This guide is just a guide and not an exhaustive set of rules to follow. It is meant to help the beginner find a fig tree or start a collection. It is also meant to help the seasoned grower expand their collection by utilizing different means of buying trees or cuttings they might not have otherwise. It will also help everyone in between, wanting to buy trees or cuttings online but not making the leap due to a lack of knowledge. This guide is not meant to drive business to or away from anyone or anywhere. It is also not meant to highlight one means of buying over any other. My hope is that everyone reading this guide will take away a little piece of information that will help them to make an informed decision when the time comes to purchase a fig tree or cuttings. Let’s start off with the easy stuff; availability. Where are fig trees available? Everywhere! Remember those figs trees that you read about in the last few paragraphs? Well, lots of them are alive and kicking today. A late springtime drive through any ethnic neighborhood in almost any city across America will net a few good fig tree finds. Most times a simple knock on the door and a polite request will get you a fist-full of cuttings. 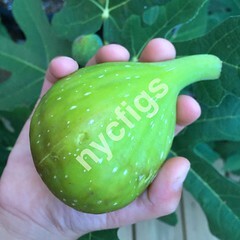 Fig trees are also available seasonally at the big box stores. These trees are grown on huge farms and sold wholesale en masse to the stores. Health of the trees is sometimes a factor and a named variety is not always genuine, but you can definitely find a bargain. The bottom line is that it’s a gamble. You’re hoping the ‘hang tag’ on the tree is actually what the tree will turn out to be and a few years is a long time to wait to find out if it’s correct. Just consider that the big box stores are a good place to buy a fig tree at a reasonable price and teach yourself the proper way to take care of it. Buying fig trees from a local nursery may cost a little more, but might net a healthier tree and a variety that is authentic. Nurseries have a reputation to uphold and they are a little choosier when it comes to purchasing inventory. They’re more likely to have a personable and trusting relationship with growers than the big box stores do. Still, local nurseries are selling you a tree with a ‘hang tag’ and you’re trusting the information provided is correct. You will find that local nurseries are more helpful than the big box stores when it comes to providing information on varieties, planting, soils, etc. Great bargains can also be had if you buy from a local nursery at the right time. If you’re lucky enough to have a boutique nursery, large hobbyist or collector close to you, your sure to find the cream of the crop when it comes to fig trees. By most accounts, these people are the ones that drive the market and come up with the healthiest and most genuine variety of figs. They generally use the finest soils and fertilizers available, something the big box stores and nurseries can't always afford to do. These are also the people that make up the largest portion of eBay sellers. Ask family, friends and neighbors. Keep an eye on local newspapers for events that highlight figs or fruit. Look for ads in newspapers or Craigslist from local growers, farmers or nurseries. Check out local farmers’ markets. Join a local fruit growers club or online garden forum. In my experience, when starting out, finding a few cuttings or a tree for free or very little money is not that hard to do. Many nurseries, backyard growers and hobbyists have an online presence. A Google search of ‘buy fig trees online’ will net you no less than 200,000 results from all around the world. Not all of them are businesses selling fig trees, but it has become a competitive market and competition can spell bargains for the consumer. Although some competition is good for the market it can also breed dishonesty. Fortunately, weeding out the dishonest vendors is painless and pretty straightforward. The easiest way to see the chatter about a web-based vendor is to Google their name. Look for reviews, comments or anything negative to show up in the search results. Any search for a vendor that sells fig trees or cuttings will almost certainly lead you to a forum used solely for the discussion of figs. Search around the forums for other people that have bought from the vendor you are concerned with and read what they have to say about their own buying experience. Dishonest vendors will quickly gain a bad reputation on the internet and they will be easy to weed out. Good, bad or indifferent, millions of people flock to the online marketplace to buy, sell, trade and haggle through all sort of goods every day, including fig trees and cuttings. In my opinion, figBid is the safest marketplace for everything figs. I love buying fig trees and cuttings from lots of different places, but online auctions are by far my favorite. Great deals on some wonderful varieties can be found, but it can get a little tricky. Pay close attention and remember that common sense prevails always. Firstly, if you live in the United States and are looking to buy cuttings from outside the US, don’t. Don’t even attempt it. Laws in the United States forbid it. The USDA prohibits or restricts the entry of certain plants, cuttings, and seeds from abroad. U.S. buyers are responsible for making sure the items they purchase meet all relevant import requirements.” Fig trees and cuttings are covered under the United States Department of Agriculture (USDA) Plant Protection Act which regulates the movement of plants and plant products into the US from abroad. Everyone wants an exotic or special variety from their hometown. Most likely those varieties already exist here in the US and a little homework will lead you to them. Poor feedback rating. Not an automatic disqualification. Read the poor feedback first and look for seller responses to get a feel for who the seller is. Look at the feedback from the person that left the negative. Is it a low number? Poor feedback may have been left by an irate customer or someone with buyer’s remorse. If you can’t read the poor feedback, it’s unclear or you’re not sure, move on. Lack of information. An item description doesn’t have to, but should include the variety name, some history or lineage, number of crops and dates they mature, description of the tree and how it grows, a detailed description of the figs (weight in grams, taste, texture, color, etc) and a description of how the tree grows for the seller in their zone. The less information about the tree or cuttings in the item description, the less likely the seller is actually growing that variety. Item descriptions that contain one line are automatically disqualified. Ask questions or move on. Selling a premium or desirable variety at an extremely discounted ‘Buy It Now’ price. Prices for premium varieties eventually do come down. But it just doesn’t happen in a hot market. If it’s too good to be true, than it’s probably not. Seller asks for buyer to pay using other than an accepted payment methods. Trusted payment methods are PayPal, Credit card or debit card processed through the seller's internet merchant account and in some cases payment upon pickup. A seller asking a buyer to use payment methods outside of trusted resources is cause for alarm. Move on. Seller wants to move transaction off the online auction. There are some legitimate reasons for doing this. But when combined with another red flag it might spell disaster. Watch out for the word ‘rare’. There are 'rare' varieties out there, but this word gets bandied about far too often in product descriptions. It's not a big red flag on its own, but when it’s linked with other factors can completely discredit an auction. Descriptions are copied from other websites. Not an automatic disqualification if the seller makes a note stating that the description was taken from somewhere else. This may be a hard factor to detect, but here’s what to do. When the item description looks generic or feels copied, highlight a small portion of the item description and copy it. Paste the highlighted portion into Google, put quotes around it and search. Look through any search results for a description that is the same as the one on eBay. If you do find a match, make sure its not the seller’s own website. If it’s not the seller’s own website, move on. Still unsure about a seller or there’s a few red flags flying at half mast? Google the seller’s name and see what comes up. If you get too many search results, Google it again with another word or words such as ‘fig’ or ‘fig tree’ to help narrow it down. Look for reviews, comments or anything negative to show up in the search results. This also might be a little easier to do when you belong to an online forum. No Pictures. Automatic disqualification. Move on. Pictures of a fig tree or cuttings but no picture of ripe fruit. Not automatically disqualified, but buyers should assume the seller has not actually grown the tree out to produce any fruit. This does not automatically disqualify a seller either. Many sellers are collectors or hobbyists that are selling their extras. Auctions should include pictures of ripe fruit, cut open to show the inside, next to a common item such as a US quarter to compare size. The item description should include a reason as to why pictures of fruit are not included. A fig in the hand… Watch out for pictures of figs sitting in the palm of a hand meant to make the fig look huge. This is not an automatic disqualification but could be if it’s the only picture. 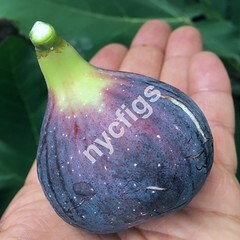 There are many differently sized figs and hands out there and a picture of a hand holding a fig does not accurately represent the true size of any fig. The picture at the top of this article is my 5 year old sons' hand holding a Cucumber fig. Although Cucumber produces extra large figs, I wouldn't consider this an accurate picture if it was the only one in the description. You don’t need to see a picture of a fig on a scale, but a more accurate representation would be several pictures of several different fruits shown with common everyday items such as a US quarter, pencil or Sharpie marker. A description explaining the weight of fruits the seller has realized is also good. My bucket runneth over. Pictures of buckets or baskets full of figs should be ignored unless they are represented as an unusually bountiful crop. This is not an automatic disqualification but could be if it's the only picture attached to the listing. Remember that you are buying a fig tree or cuttings and not a bucket or basket of figs. Sellers would like you to think that you’ll have more figs than you know what to do with. The reality is that from a cutting it will take you at least 1 1/2 - 2 years to produce a fig, 2 -3 years to get a few decent ripe figs and 3-5 years before you get a decent ripe crop of figs. Results will vary when buying fig trees or grafting. Stolen pictures. How do you know if a picture is stolen? You don’t unless you're told so or search for yourself. There are many methods of searching for stolen images and some are more advanced than others. If you're comfortable with your computing skills, Google "How to search for stolen images" and find a method that works for you. Searching for stolen images is not a necessity and as a buyer you'll be exposed to a generous amount of pictures. Eventually you’re going to say, “Hey, haven’t I seen that picture somewhere before?” It happens to all of us. If you know or think a picture is stolen, the auction is discredited. Move on. Generic pictures. Search eBay for ‘fig cuttings’ and you’ll almost certainly see the exact same picture for several different auctions. Some of these auctions may be for different varieties and even have different sellers. Don’t even think about spending your money. Move on. Shared pictures. 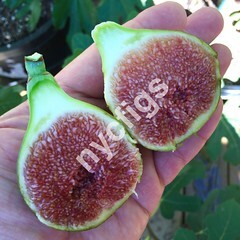 At times during your search you may see the same ripe fig picture from several different sellers. Not a disqualification if seller states they are not their own pictures and used with permission from another person. Of course the varieties of the two (or more) auctions must match. If the varieties don't match or the disclaimer is absent, move on. For educational purposes. You're not buying an education, you're buying a fig tree. Sellers may adequately represent the variety being sold but add a statement about the pictures being a representation or for educational purposes. It’s only fair that buyers should be able to see exactly what they are buying. Take your money elsewhere. Move on. No pictures of cuttings. 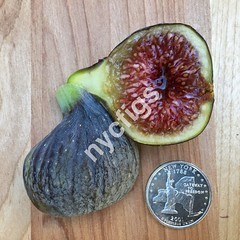 Sellers are selling fig cuttings and will place pictures of parent tree and fruit, but no pictures of actual cuttings that you will be receiving. This may be a little generic but it is not an automatic disqualification. Some very reputable sellers have thousands of quality cuttings and not enough time to take pictues of them all. These are usually known sellers and a Google search of the sellers name will usually return positive results. A trend that popped up in 2016 is sellers stating they will prune the buyers' cuttings at the time of sale. This is a great practice and ensures buyers the freshest cuttings. So if there are no pictures of the actual cuttings, keep it in the back of your mind and look for other red flags. No pictures of live tree. Definitely a red flag but not a disqualifier. Some larger nurseries will post generic pictures that represent the fig tree you'll be receiving. The same nursuries also sell small trees or tissue cultures in bulk. The buyer must make their own decision here. Do your homework and use some of the tools described above to help you decide to trust the seller or not. Lack of watermarked pictures. We’ve all seen them, those annoying words, designs or patterns that appear in the background of a picture. Watermarks have become popular among sellers as a tool to help prevent theft of their pictures. It’s also a tool that’s useful for buyers. It helps to credit sellers because it shows that sellers took the time to take a good picture, watermark and insert it into an auction. Watermarks should be identifiable with the seller in some way. If the connection is not immediately apparent, contact the seller and ask. Lack of watermarked pictures is not an automatic disqualification. Poor picture quality. Poor picture quality has ‘lazy seller’ written all over it. Pictures don’t have to be professional but they should represent a certain level of competence. Although it doesn’t automatically disqualify a seller, you should be on alert and proceed with caution. Check for poor quality pictures in the seller’s other auctions. Look for any other factors that would throw up a red flag and apply common sense. Maybe they’re just a bad picture taker; maybe they’re trying to hide something. If you’re unsure, move on. Know your USDA Plant Hardiness Zone. Visit the USDA website and input your zip code to get your Plant Hardiness Zone. It’s useful information to have when searching for varieties that grow well in your area, diagnosing plant issues, speaking with sellers, etc. Nomenclature. An entire volume can be written about fig naming. A fig naming authority doesn’t exist. Many named figs are hundreds if not thousands of years old. Some figs are named by well respected collectors or fruit authorities. Others are named by the person to whom they were discovered by. Many fig names are made-up by vendors who’ll put their own spin on a current name. Keep this in mind, almost every named fig available has multiple names (synonyms) and there is a ton of information available for named varieties of figs. If you’re searching for a certain named variety and can’t find anything written about it, it’s probably a made-up name. Just realize that it’s one of the vagaries of figs. The Next Big Thing. Try and steer away from any fig tree that is purported to be the ‘next big thing’ or the hot variety of the season. Most times it will cost you a bundle of money and in the end you will be disappointed. It’s a fact, today’s hot varieties will sell for pennies on the dollar in a year or two. Alternatively, if buying a hot variety doesn’t break the bank and makes you happy, find a reputable vendor and buy it. There’s nothing wrong with wanting to own a desirable variety. Be familiar with regulations. Check your state laws regarding the import of plant material from other states. All states have laws regarding the import of plant material from other states. It's important to know where your state stands as some states have stricter enforcement regulations than others. Ask sellers, email your state agricultural department or the USDA for more information. Don’t buy fig seeds. Some will grow, most won’t. A high percentage of the ones that grow will not become the variety you think they will and some will not even bear fruit. The waiting time to find out is 2-3 years if everything is perfect. If growing your own fruit is what you're after, don’t bother with seeds. They're a waste of time and money. Avoid buyer remorse; don’t overpay. The easiest way to do this is to avoid a bidding war. Place your bid as the highest price you are willing to pay for the item. You won’t win as many auctions, but it’s safe and you’ll be happy with the auctions that you do win. You can also wait until the last few moments of the auction and drop your best price. This is a risky move because you have to know exactly when the auction is ending and you have to be ready to place your bid. It sounds easier than it really is, but when you master the method your final bids will be lower. Also, do not pay an overly inflated Buy It Now price. There will always be another auction for the variety that you want. Negative feedback. Contact sellers before leaving negative feedback. Contact sellers before leaving negative feedback. Contact sellers before leaving negative feedback. This isn't a typo. I’m making the point that most sellers are honest and almost any disagreement can be worked out, especially when it comes to fig trees or cuttings. Those that are quick to leave negative feedback will regret it most of the time later on. Work out your issues with the seller. Ask questions. This goes for eBay sellers and any other web-based vendor. In my experience, fig vendors, growers, etc. are more than willing to answer any of your questions. If you don’t get answers or are uncomfortable, move on. Practice your rooting skills. Practice, practice, practice. There are almost as many propagation methods on the internet as there are varieties of figs. Choose one that suits your lifestyle and practice. There is no shame if you can’t master rooting a fig cutting right away. There are a hundred different factors that will contribute to your failure. Successfully rooting and growing fig trees takes lots of time, energy and patience. Don’t be afraid of successfully rooting too many cuttings. Fig trees make wonderful gifts. Report suspected scams and fraud to figBid. If you see something, say something.